Home » Blogs » Sanders to Introduce Single-Payer Bill – How Much Will It Cost? Sanders to Introduce Single-Payer Bill – How Much Will It Cost? Tomorrow, Senator Bernie Sanders (I-VT) is expected to introduce a single-payer health care bill (“Medicare for All”). The legislation also has several co-sponsors and has sparked significant interest in moving the U.S. towards a single-payer health system, where the federal government would be the sole insurer of health care. While the details of this particular legislation are unknown, we analyzed a related proposal Senator Sanders made during his 2016 presidential run. At the time, we found his proposal would cost roughly $25 trillion over a decade, and we estimated that only $11 trillion of that would be paid for with higher taxes. The remaining $14 trillion would be added to the national debt. Including interest but excluding possible economic effects of this plan, debt would be about $16 trillion higher after a decade because of its enactment. As a result, debt as a share of the economy would rise from 77 percent of Gross Domestic Product (GDP) today to 148 percent of GDP by 2027 (compared to 91 percent under current law) – more than 40 percent higher than the previous record set in 1946. 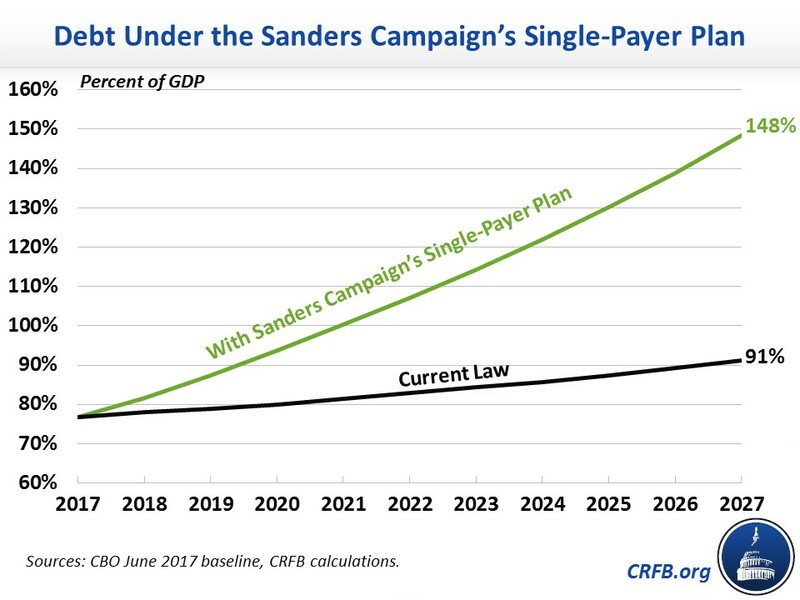 While tomorrow’s legislation is likely to differ from Senator Sanders’s campaign proposal in some key ways, it is clear that any proposal to reshape the U.S. health care system as a single-payer system will have substantial fiscal implications. In order to avoid adding to the national debt, Senator Sanders’s legislation will need either to offer less generous coverage than his campaign proposal, provide more robust offsets, or both. And unfortunately, there is limited space to raise those remaining offsets from high earners alone. Read more about the Sanders campaign’s original offsets and additional offsets as well as its full policy proposals. Some aspects are also discussed below. What Did the Sanders Campaign Single-Payer Plan Propose? During the 2016 presidential campaign, Senator Sanders frequently touted his support for “Medicare for All” and released an outline for how he’d like to replace the U.S. health care system. Under the Sanders plan, all Americans would have access to health coverage through the federal government as the sole health insurer, responsible for paying providers (hence the term single-payer) and negotiating payment rates. Although the system is framed as “Medicare for All,” its details are actually quite different than Medicare and in many ways would be far more generous. Under the Sanders plan, individuals would face no deductibles, co-payments, or direct premiums (though they would be taxed) – the government would pay all costs. Additionally, the package of covered benefits would be much more generous than Medicare, adding in full vision, dental, mental health, substance abuse, and long-term services and supports to the Medicare package (our cost estimate does not include long-term care). Importantly, this new system would entirely subsume current government spending on health care with just two exceptions for the Indian Health System and the Veterans Health Administration. That means that all funding for Medicaid and Medicare, two of the largest government programs, would fall into this system. States would be required to contribute their approximately $4 trillion of funding streams over ten years currently going towards Medicaid and the Children's Health Insurance Program. How Much Would The Sanders Campaign Single-Payer Plan Cost? While the Sanders campaign itself estimated its plan would cost about $13.8 trillion over a decade, their estimates likely overstate savings from administrative costs, drug prices, and provider costs and underestimate the effect of the plan on utilization. Based on a number of independent estimates at the time, we concluded the cost would be much higher – closer to $25 trillion over a decade, incorporating savings from eliminating nearly all current law federal health spending and excluding the cost of the long-term care component. We are aware of three different independent estimates of the Sanders campaign health plan. On the low end, health economist Kenneth Thorpe estimated the plan would cost the federal government $24.7 trillion over a decade. On the high end, the Center for Health and Economy estimated the plan would cost between $34.7 trillion and $47.6 trillion. 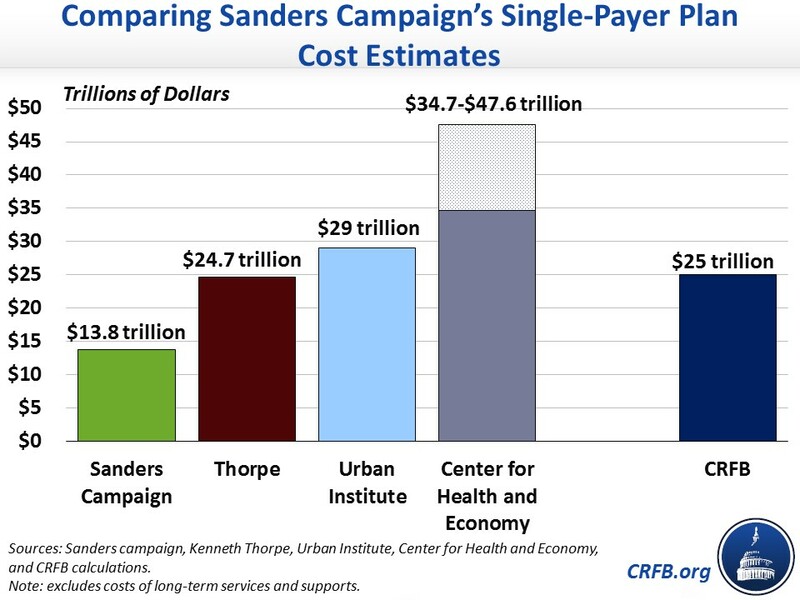 Finally, a number of analysts at the Urban Institute estimated the Sanders campaign plan would cost roughly $32 trillion. Importantly, this estimate includes Senator Sanders's plan to offer universal long-term care benefits (about $3 trillion) and assumes the federal government is unable to compel states to continue paying what they currently do under Medicaid (about $4 trillion). Removing those two assumptions would reduce their estimate to about $25 trillion. How Would The Sanders Campaign Pay for Its Single-Payer Plan? To finance his health care plan, encouragingly, Senator Sanders proposed a series of offsetting tax increases. However, we concluded that these offsets would cover less than half of the plan’s costs and would virtually max out available revenue from higher earners. The specific proposals form the Sanders campaign included a 6.2 percent employer payroll tax, a 2.2 percent across-the-board income tax, significant income tax rate hikes for high earners, estate tax reforms and increases, and changes to the tax treatment of capital gains and dividends so that both are taxed as ordinary income and capital gains are generally taxed at death. More detail on the offsets can be found at Analysis of the Sanders Single-Payer Offsets and Additional Offsets for Senator Sanders’s Health Plan. Including revenue gains from ending employer-provided health insurance, we estimated these taxes would raise about $11.1 trillion over a decade. This is somewhat lower than the Sanders campaign's estimates of $13.9 trillion but relatively close to the $11.9 trillion estimate put forward by the Tax Policy Center (TPC) – the major difference being that TPC estimates significantly higher revenue from taxing capital gains at death than official scorekeepers have found. Table footnote appears at bottom of this document. Importantly, actual revenue from these policies is likely to be less due to the negative economic effect of the large marginal tax rate increases. Although there is considerable disagreement over the exact revenue-maximizing tax rate for ordinary income (the top of the Laffer curve), many economists believe it to be in the range of 60 or 70 percent. 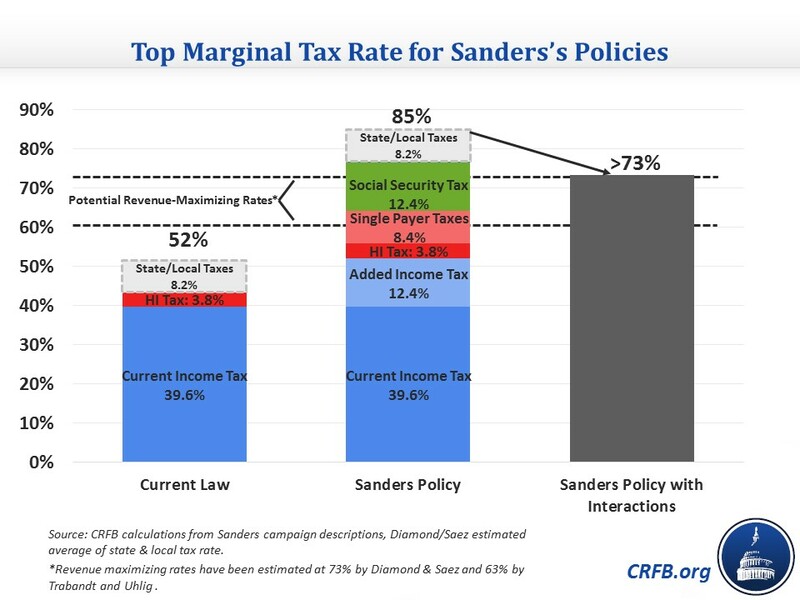 When combined with his other campaign proposals, we found the Sanders campaign’s plan would lead to a top tax rate of about 73 percent - which is at or above the likely revenue-maximizing rate. Without Senator Sanders’s non-health care tax policies, the rate would be somewhat lower but still quite high. As a result of these very high rates and aggressive base broadening, few options would remain to finance the remaining costs by levying taxes on high earners alone. While there are many potential benefits to a single-payer health care system, it can come with an extremely high cost to the federal Treasury. 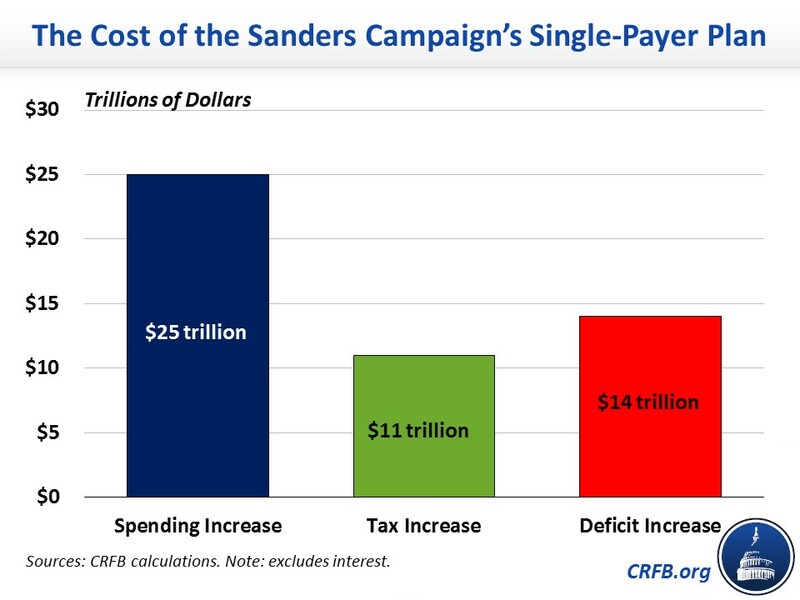 Senator Sanders’s campaign plan would likely cost $25 trillion over a decade – effectively increasing total spending by more than 50 percent. And with only $11 trillion of offsets, the plan would add $16 trillion to the national debt and bring it to 148 percent of GDP by 2027, higher than any time in history. While Senator Sanders’s campaign deserved credit for trying to pay for its health plan, we hope that tomorrow’s legislation will learn from that effort and actually succeed in doing so. A fiscally responsible single-payer plan may have to find ways to reduce costs to the federal government, including through deductibles, co-pays, premiums, and various provider payment changes. At the same time, any single-payer plan will require substantial new tax revenue – revenue that almost certainly cannot be raised through taxes on high earners alone. It’s not enough to believe every American should receive government-provided health care; policymakers need to say how the government will pay for it. No plan that requires trillions of dollars of new debt, on top of today’s debt levels, will be passable or sustainable. Whether it’s free health care, free college, or massive tax cuts, policymakers that promise dessert without vegetables will end up delivering neither. +CRFB did not estimate the impact of the proposed capital gains and dividends increase or tax expenditures savings. With regards to the tax expenditure savings, CRFB assumed the savings provided by the Sanders campaign. With regards to the capital gains and dividends increase, it is our assessment that when stacked after previously proposed increases, the rise in the capital gains rates – based on common scoring conventions – would result in significant revenue losses, likely in excess of gains from higher dividend rates. This assessment is based on the assumption that capital gains and dividends would be taxed as ordinary income under the new rate schedule. Rather than estimating a loss, we scored the impact as zero. The effect of the new policy to repeal step-up basis is shown as a separate line, which represents both the direct effect of removing step-up basis and the interaction effect with increased capital gains rates. This interaction is the only one measured.